Kauai is, by far, my most favorite one of the Hawaiian Islands to spend time on and the one on which I like to lug my photography gear around. I have been visiting the island since 2003 and I finally got a chance to photograph a wedding on what I believe is the most picturesque island in the Pacific. The couple is Frank and April from Denver, Colorado, and they decided to have a Destination Wedding on the island with roughly 35 of their family members and closest friends. The week was filled with boat rides, snorkeling, taking long naps on the beach, hiking through mud trails, hanging out with two lovely families and having a blast trying to photograph every minute. 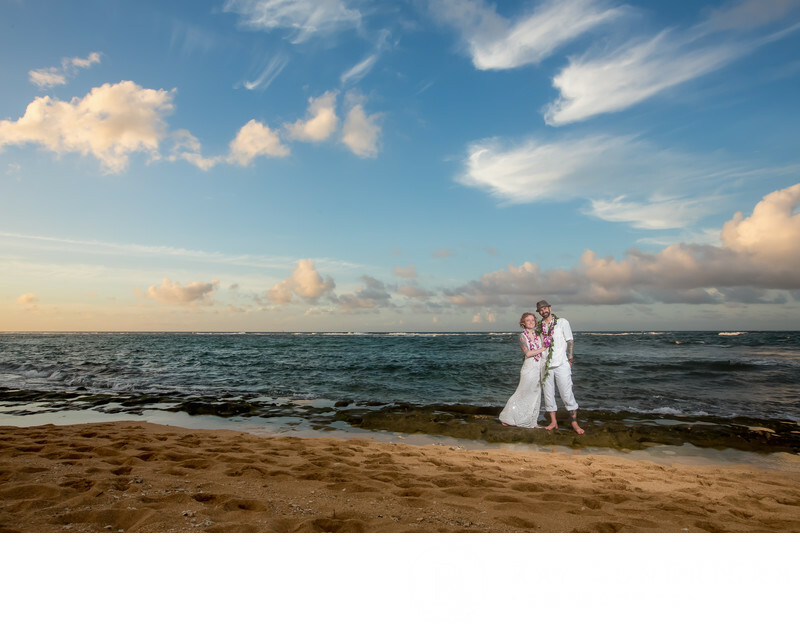 This photo was taken very close to sunset on the northern side of the island, near the Kepuhi Point, shortly after the couple's ceremony on Hanalei Bay near the Hanalei Pier. The shuttle took the entire wedding party and guests from the beach where the ceremony was held to the Mediterranean Gourmet Restaurant off the Kuhio Highway in Hanalei, which has a nice view of this part of the beach. I was keeping my eye on the sun because it was close to sundown so as soon as I started to see some colors in the clouds I asked the couple to do one last photo session before their dinner arrived. I grabbed my camera and a couple of lenses. For this shot I opted for the Canon 16-35mm f/2.8 at around 20mm to catch a large part of the scene and the aperture set to f/11 because I wanted Frank and April to be sharp. Setting the lens to f/11 at an ISO of 200 at this time of day also meant that light was going to be an issue so Melodi used a Profoto B2 light on a monopod with no modifier, which is apparent because of the light spill on the sand. I could have covered it up in post but it really doesn't bother me in the image so I left it. I would have opted for barn doors if we would have had a set with us to correct this small issue, but we didn't so the image is what it is. I was more concerned with getting the couple lit properly while keeping to sky and clouds to the color they were to the naked eye. We ended up getting a few more nice shots in this location that you'll see further down in the gallery but this was the one that I felt represented the couple on Kauai the best. 1/160; f/11.0; ISO 200; 20.0 mm.